The radio and display receiver assembly panel switches and steering switches are checked in the following procedure. (a) Enter diagnostic mode (See page ). 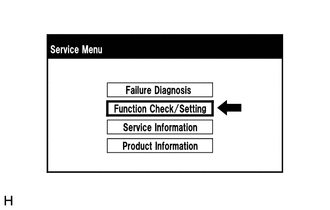 (b) Select "Function Check/Setting" from the "Service Menu" screen. 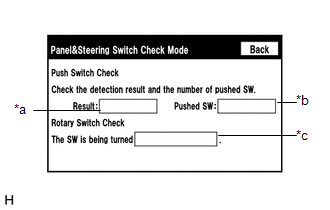 (c) Select "Panel & Steering Switch" from the "Function Check/Setting I" screen. "Pushed" is displayed when any switch is pushed. Number of switches pushed at once is displayed. If more than 3 switches are pushed at once, "More than 3" is displayed. If 4 or more switches are pushed at once, "More than 3" is displayed. Direction of rotary switch is displayed. (1) Operate each switch and check that the switch conditions are correctly displayed. When the "SETUP"*1 or "APPS"*2 switch is pressed and held for 3 seconds or more, diagnostic mode will be canceled. The touch switches on the screen are checked in the following procedure. (c) Select "Touch Switch" from the "Function Check/Setting I" screen. 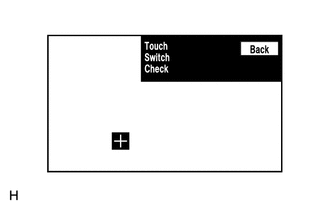 (1) Touch the display anywhere in the open area to perform the check when the "Touch Switch Check" screen is displayed. A "+" mark is displayed where the display is touched. The "+" mark remains on the display even after your finger is removed. 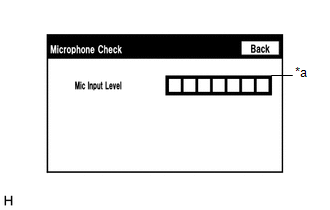 The microphone and microphone input level are checked in the following procedure. 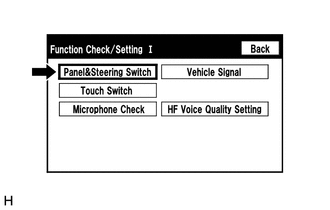 (c) Select "Microphone Check" from the "Function Check/Setting I" screen. Monitors the microphone input level every 0.1 seconds and displays the results in 8 different levels. (1) When speaking into the microphone, check that the microphone input level meter changes according to the input level. The microphone is active at all times when this screen is displayed. 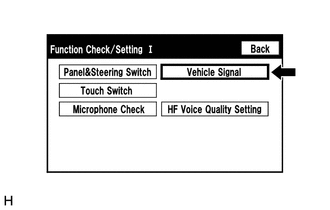 Vehicle signals received by the radio and display receiver assembly are checked in the following procedure. 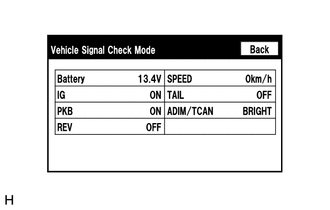 (c) Select "Vehicle Signal" from the "Function Check/Setting I" screen. Ignition switch ON/OFF state is displayed. Parking brake ON/OFF state is displayed. Reverse signal ON/OFF state is displayed. Vehicle speed is displayed in km/h. Tail signal (light control switch) ON/OFF state is displayed. Brightness state DIM (with)/BRIGHT (without) is displayed. Only items sending vehicle signals will be displayed. This screen displays vehicle signals input to the radio and display receiver assembly. (1) When the "Vehicle Signal Check Mode" screen is displayed, check all the vehicle signal conditions. 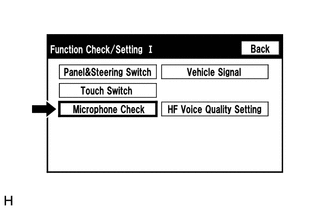 The hands-free voice quality of a "Bluetooth" compatible phone can be adjusted using the following procedure. 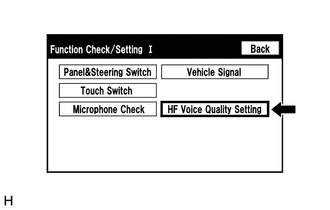 (c) Select "HF Voice Quality Setting" from the "Function Check/Setting I" screen. 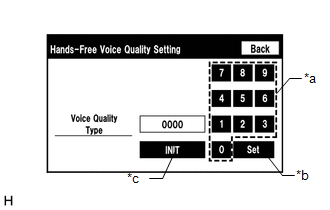 (1) If necessary, refer to the table below to adjust the voice quality type with the numeric keypad. (2) When adjusting the settings, use the number pad on the screen to input the voice quality type according to the table. The other party hears background noise when listening to your voice. The amount of background noise the other party hears when listening to your voice is reduced. The volume of voice the other party hears when listening to your voice may temporarily drop. The other party hears a lot of background noise when listening to your voice. The amount of background noise the other party hears when listening to your voice is sharply reduced. The other party hears weak echoes. The amount of echo is reduced (low level). Sound quality of the other party deteriorates (low level). The other party hears strong echoes. The amount of echo is reduced (high level). Sound quality of the other party deteriorates (high level). The other party hears background noise and weak echoes when listening to your voice. The volume of voice may drop temporarily. The other party hears background noise and strong echoes when listening to your voice. The other party hears a lot of background noise and weak echoes when listening to your voice. The other party hears a lot of background noise and strong echoes when listening to your voice. The default value is "0000". Settings will be applied when the setting button is selected. If voice quality type values that are not in the table are input, the setting will not be applied and a positive effect may not be gained. If the quality of phone calls decreases due to the changed settings, return the settings to "0000" by selecting "INIT". This function is used when checking the speaker wiring and whether the speakers are functioning properly. (a) Turn audio mode on and play any audio source. This audio source will be used for the speaker check. (b) Enter diagnostic mode (See page ). 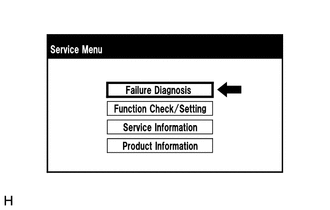 (c) Select "Failure Diagnosis" from the "Service Menu" screen. 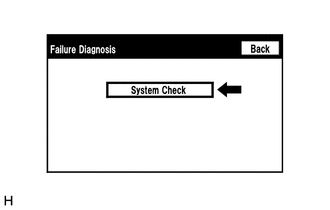 (d) Select "System Check" from the "Failure Diagnosis" screen. 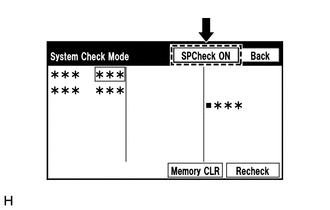 (e) Select "SP Check ON" from the "System Check Mode" screen. (f) Check the speaker wiring and check that the speakers are functioning properly. Check that each speaker outputs sound from the selected audio source properly. "SP Check OFF" is displayed during the speaker check. Sound can be heard from the speakers around the vehicle in order beginning from a speaker on the front side. More than one speaker may sound simultaneously depending on the speaker wiring. (1) "SP Check OFF" is selected. (2) The ignition switch is turned off. (3) Diagnostic mode is turned off. (4) The screen is changed to another screen. (5) Audio mode is turned off. This function is used to check the cause when the radio and display receiver assembly screen is blacked out. (a) Check Software Error History. (4) Enter the following menus: Body Electrical / Navigation System / Utility / Software Error History. (5) When an item is stored for Software Error History, record it before repairing the radio and display receiver assembly. Software Error History can store up to 5 history data items. If a new software error occurs when 5 data items have already been stored, the oldest data is cleared and the new data is stored. If an error that is unsupported by the Techstream occurs, a "-" is displayed for the display items. (b) Clear software error history. (1) When DTCs are cleared using any of the following operations, Software Error History will be cleared as well (See page ). Cleared using the system check mode screen. Cleared using the unit check mode screen. This function is used to check the cause of an optical disc error. (a) Check Optical Disc Error History. (4) Enter the following menus: Body Electrical / Navigation System / Utility / Optical Disc Error History. (5) When an item is stored for Optical Disc Error History, record it before proceeding with troubleshooting. Displays the type of error. Displays the date and time that the malfunction occurred. When a disc read error occurs. The disc cannot be read because of dirt or scratches. The disc cannot be read because it is inserted upside down. An unsuitable disc is inserted. When an error occurs while decoding MP3/WMA/AAC files. When MP3/WMA/AAC files cannot be played back because they are unsupported. Even though the file extensions are MP3, WMA or AAC files cannot be played back because the header information cannot be read. When a disc without music data is played back. When there are no playable MP3/WMA/AAC files. When a file with copyright protection that cannot be played back is played back. Optical Disc Error History can store up to 7 history data items. If a new optical disc error occurs when 7 data items have already been stored, the oldest data is cleared and the new data is stored. If an error that is unsupported by the Techstream occurs, a "-" or blank is displayed for the display items. (b) Clear optical disc error history. This function is used to detect disconnection of the video devices. In order to inspect the RSE, a disc should be inserted into the radio and display receiver assembly. (a) Check Video Device Connection Check. (4) Enter the following menus: Body Electrical / Navigation System / Utility / Video Device Connection Check. (5) When an item is stored for Video Device Connection Check, record it before proceeding with troubleshooting. DTCs are stored when errors are detected. (b) Clear video device connection check. (1) When DTCs are cleared using any of the following operations, Video Device Connection Check will be cleared as well (See page ). This function is used to check the connection history when the connection between the radio and display receiver assembly and a "Bluetooth" device is unstable. (a) Check "Bluetooth" Connection History. "Bluetooth" Connection History displays data stored in the internal memory of the ECU, such as the date a "Bluetooth" connection was attempted and the progress of a "Bluetooth" connection. By checking "Bluetooth" Connection History, the date, cause, etc. of a "Bluetooth" device failing to register or connect can be analyzed. "Bluetooth" connection history indicates the estimated cause of a malfunction, but does not determine it. Therefore, checking "Bluetooth" Connection History may not improve the problem. Performing inspection using the Techstream before recording the "Bluetooth" Connection History may clear the operation history. (4) Enter the following menus: Body Electrical / Navigation System / Utility / "Bluetooth" Connection History. (5) When an item is stored for "Bluetooth" Connection History, record it before proceeding with troubleshooting. Date and time of "Bluetooth" connection are displayed. Date and time of "Bluetooth" disconnection are displayed. Type of "Bluetooth" Connection History is displayed. "Bluetooth" connection result is displayed. "Bluetooth" connection status is displayed. "Bluetooth" device address is displayed. The number of retries when "Bluetooth" connection was performed is displayed. "Bluetooth" device was registered as a hands-free device properly. "Bluetooth" device was registered as a "Bluetooth" audio device properly. Could not perform "Bluetooth" connection properly. Check that the "Bluetooth" device is in the cabin. Check that the "Bluetooth" device is not connected to another device using the "Bluetooth" connection. Restart the "Bluetooth" device and operate it again. Wrong PIN code was input for PIN code verification. Did not select the confirmation button even though a passkey was displayed. A verification error occurred between the radio and display receiver assembly and "Bluetooth" device. Restart the radio and display receiver assembly and "Bluetooth" device, and operate them again. "Bluetooth" connection was disconnected by operating the "Bluetooth" device. Perform "Bluetooth" device registration again. 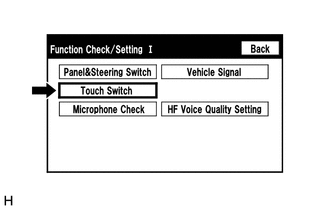 "Bluetooth" connection could not be established due to wave interference around the vehicle. Check for wave interference and perform "Bluetooth" device registration again. "Bluetooth" device was outside the communication area. Bring the "Bluetooth" device near the radio and display receiver assembly and perform "Bluetooth" device registration again. "Bluetooth" setting on the "Bluetooth" device was off. Change the "Bluetooth" setting to on and perform "Bluetooth" device registration again. Turn the "Bluetooth" device on and perform "Bluetooth" device registration again. A malfunction occurred in the "Bluetooth" device. "Bluetooth" device information could not be stored in the radio and display receiver assembly. An error other than above occurred. After turning the ignition switch off and back to ON again, perform "Bluetooth" device registration again. Registration was suspended by operating the radio and display receiver assembly or "Bluetooth" device. "Bluetooth" device was connected as a hands-free device properly. Verification of authentication key between the radio and display receiver assembly and "Bluetooth" device failed. If "Bluetooth" connection failed again even though the "Bluetooth" connection was performed, perform registration again. Could not find a "Bluetooth" device near the radio and display receiver assembly. Bring the "Bluetooth" device near the radio and display receiver assembly and perform "Bluetooth" connection again. Check for wave interference and perform "Bluetooth" connection again. Change the "Bluetooth" setting to on and perform "Bluetooth" connection again. Turn the "Bluetooth" device on and perform "Bluetooth" connection again. HFP was disabled on the "Bluetooth" device. Enable HFP on the "Bluetooth" device and perform "Bluetooth" connection again. "Bluetooth" device which operation had not been confirmed was used. Check that the "Bluetooth" device is hands-free compatible and its operation has been confirmed (See page ). Connection was interrupted by operating the radio and display receiver assembly or "Bluetooth" device. "Bluetooth" device was connected as a "Bluetooth" audio device properly. AVP was disabled on the "Bluetooth" device. Enable AVP on the "Bluetooth" device and perform "Bluetooth" connection again. Check that the "Bluetooth" device is "Bluetooth" audio compatible and its operation has been confirmed (See page ). The "Bluetooth" device was moved outside of the communication area. Move the "Bluetooth" device into the communication area. "Bluetooth" connection was disconnected due to wave interference around the vehicle. "Bluetooth" connection was disconnected by operating the radio and display receiver assembly. Outside the cellular phone service area. Move the vehicle into a cellular phone service area, check that the "Bluetooth" device is connected to the vehicle and operate the device again. Redial of the "Bluetooth" device was restricted and could not make a hands-free call. Could not make a hands-free call due to a "Bluetooth" device malfunction. Could not make a hands-free call due to a radio and display receiver assembly malfunction. Could not make a hands-free call from the radio and display receiver assembly because the call status of the "Bluetooth" device was not transmitted to the radio and display receiver assembly. (b) Clear "Bluetooth" connection history. (1) When DTCs are cleared using any of the following operations, "Bluetooth" Connection History will be cleared as well (See page ).